There was a time when Karlin was a total blank to me. For the first years I lived in Prague, I never set foot in that neighborhood. In the last few years, I've been stopping by occasionally at the Expats.cz office in Karlin. In the beginning, the dining options in the area seemed pretty dire. Ristorante Porto was one I thought was decent. 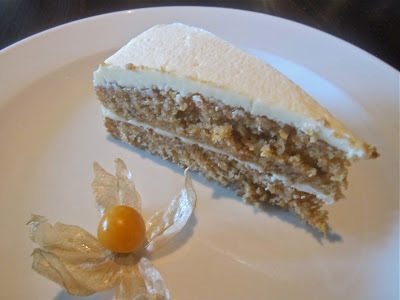 More recently, I heard about the opening of Krystal Mozaika Bistro, and I heard good things. 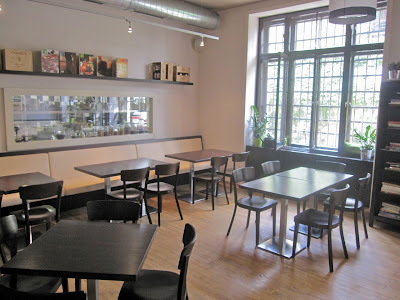 This restaurant is connected to the Vinohrady restaurant, Mozaika, which I used to like but haven't been to in a few years. 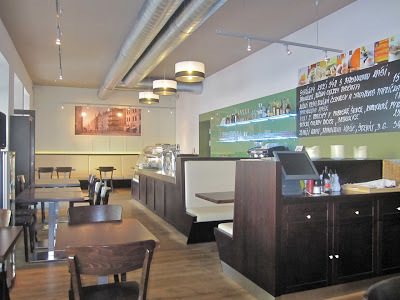 So I when I was in Karlin, I dropped by for my first solo visit. It's right next to the cute and quirky Polévkárna on Sokolovská. This was back when outdoor dining was still a regular option. Inside, the looks are smart and modern. There's a chalk board in the front with a variety of changing specials. The back room keeps up the same design theme. It has a long window to the kitchen and you can watch the chefs at work. I always enjoy that. I sat in front and started off with a beer. 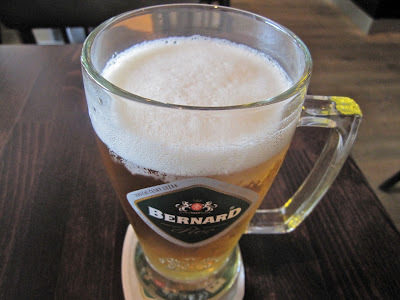 I had a half-liter of the Bernard 10 degree (27 CZK). It was a little flat, so I didn't enjoy it much. Then I had the 150 gram Krystal beef burger (169 CZK). There is also a 300 gram version (289 CZK). The one I had was plenty big. It's hard to imagine consuming the bigger beast. 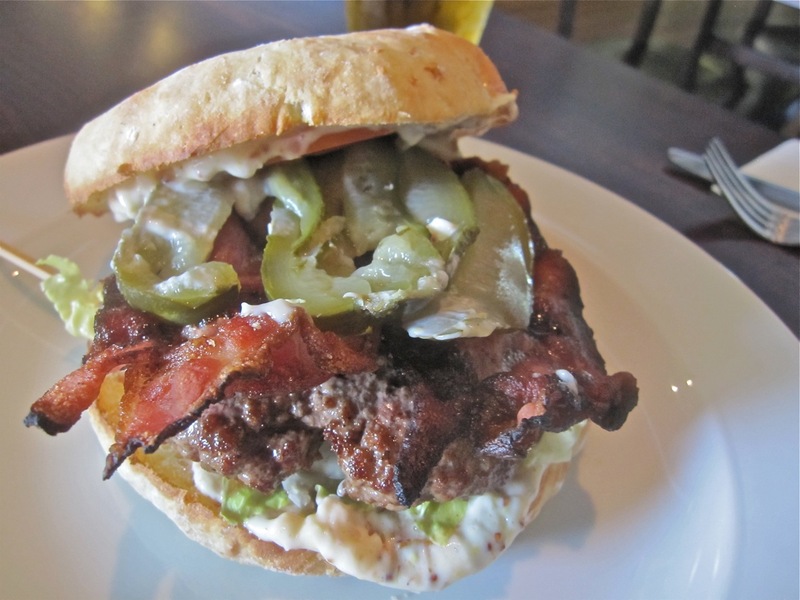 The burger is made with homemade onion bread, bacon, onion, pickle, lettuce and home-made mayonnaise with mustard seed. It was excellent. The patty was made with high-quality, juicy beef. It was cooked to medium. I liked the bread. The bacon was plentiful and American-style crispy. I found the burger superior to the one I had at Mozaika years ago. 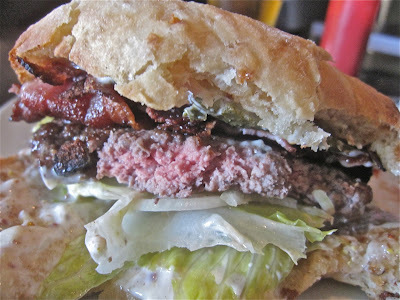 My main quibbles are that there was too much mayo, and it was hard eat and to hold the big burger together. By the last bites, it was a total mess. The fries are extra (39 CZK). 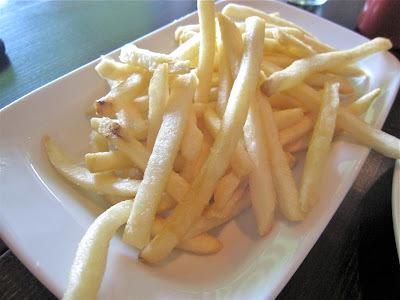 They were hot and crisp, very McDonald's-like. They were fine for that style, but nothing special. For dessert, I had the crème brûlée (59 CZK). 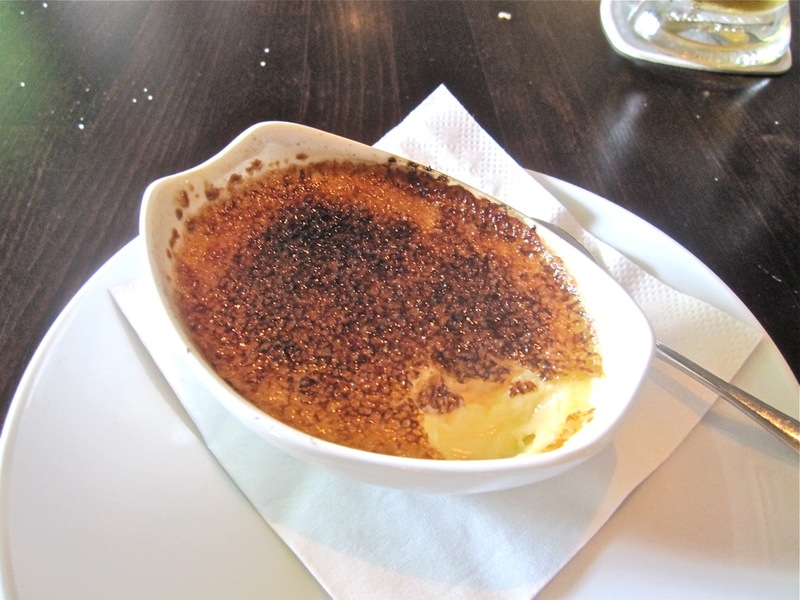 It was well-executed, with a hot, freshly-torched caramelized sugar top and a cool, sweet, eggy cream underneath. The dish was shallow and the portion not large, but still I thought it nice for the price. The bill for this meal was 294 CZK. For my next visit, I was tempted by the flank steak. I'd seen a picture of it on my Foodspotting iPhone app. Instead, I ordered a daily special, the veal entrecote (255 CZK). 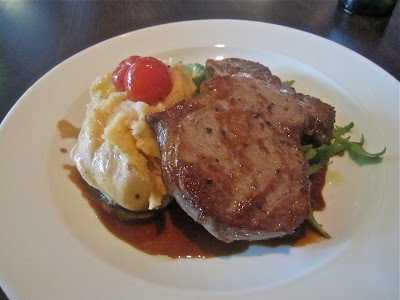 The meat was very good quality and it sat on a savory, peppery demiglace. My big regret, which I realized as I cut into it, was that I didn't say how I wanted it cooked. It was delivered cooked all the way through, which made the veal tougher than it should have been. The buttery mashed potatoes were mixed with sun-dried tomatoes. It was an excellent side for this dish. For dessert, I had their carrot cake (55 CZK). 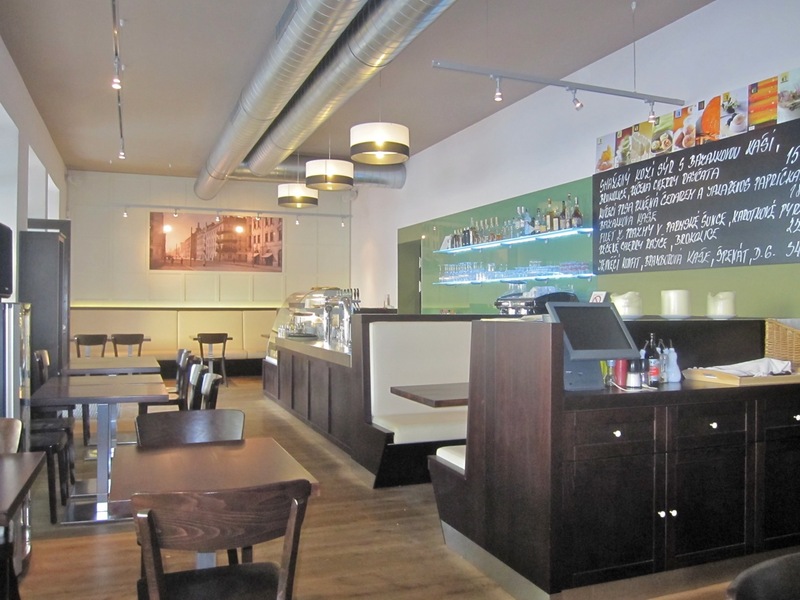 The modest slice was not as fancy as one you'll see at a place like Bakeshop Praha. It was moist and chock full of walnuts -- almost too many. The creamy icing was delicious. It was simple, but I'd get it again. This time around, I paid 343 CZK. For my last visit, I sat in the back with a friend. 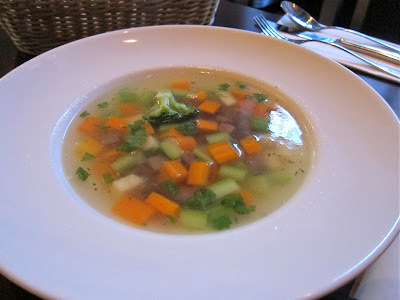 My friend had vegetable soup (65 CZK). I'm not a big fan of this type of soup, but I thought it was very tasty. The broth had a lot of flavor. The carrots, broccoli, and celery were cooked aldente, not too hard, not too soft. There were small, soft pieces of beef and potato in there, too, so it was not for vegetarians. Then, my friend had the goat cheese salad (165 CZK). This was the least successful of all the dishes I tried. 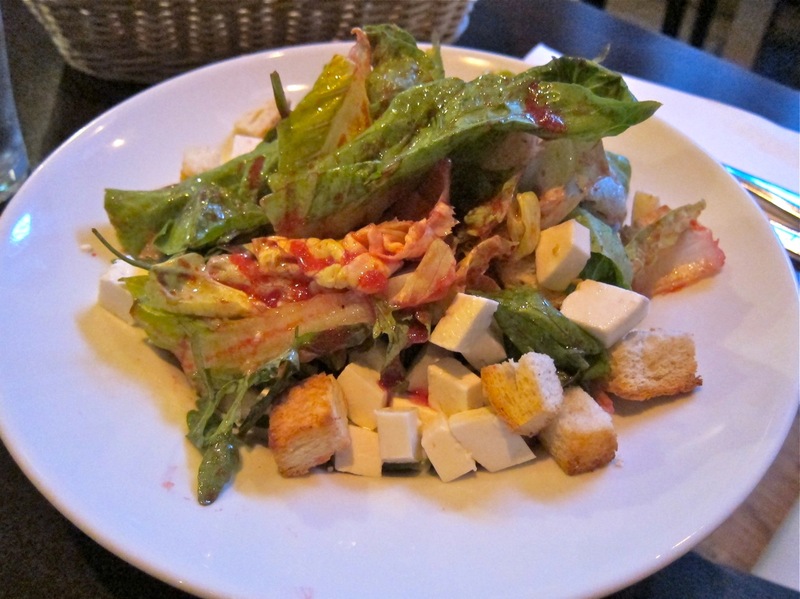 There was a nice mix of greens, but cheese came in cool, rubbery cubes. The waitress said the dressing was something special, but we found it was a rather weak raspberry vinaigrette. There were some crunchy croutons, but that was about it. It didn't feel like a good value. 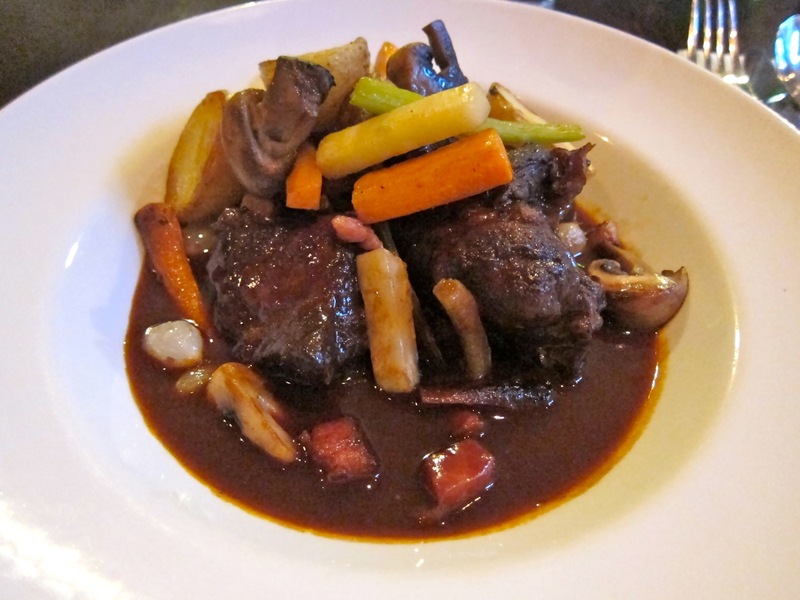 I went for the Beef Bourguignon (199 CZK). This I liked. The beef had been slow-cooked and was relatively tender. But it still required slicing with a knife and there was some gristle. The cooked veggies with it were great. The carrot, pearl onion, and mushroom, mixed with some pork, maintained their crunch. The sauce was both sweet and source with the clear flavor of wine. But aside from that, there was not much complexity to it. While I enjoyed this dish and would get it again, it was not as good as the very tender and flavorful version at Brasserie La Gare. This dinner for two, which included a big bottle of mineral water, a glass of wine, dessert, and coffee came to 619 CZK. Service was good the first two visits, but occasionally absent too long on the last visit. 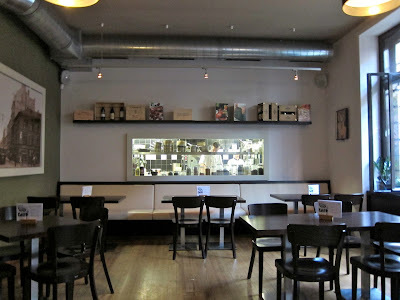 In the big picture, I enjoyed both the atmosphere and the food at this restaurant. I'll return, for sure. 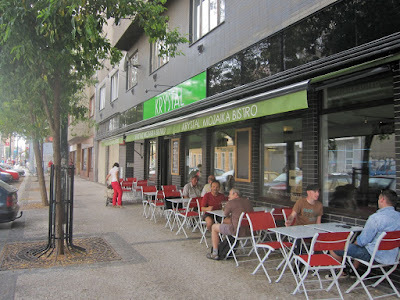 Karlin is turning into a nice neighborhood with more and more good places for sensitive people like me. 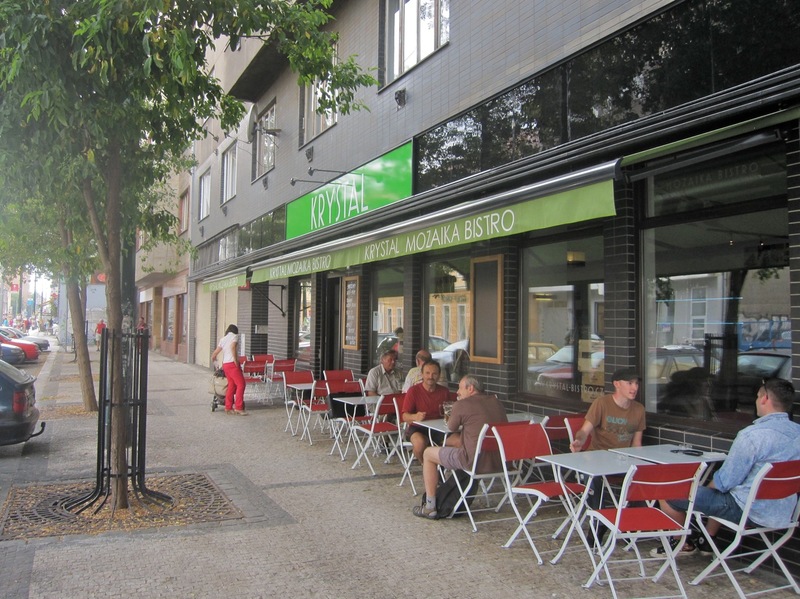 And right now, Krystal Mozaika Bistro is at the top of my list of places to get something to eat in the area.